No deposit or cleaning fee required! 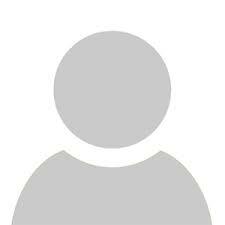 We simply charge a $49 property damage protection fee that is underwritten by CSA online. There are no other fees. 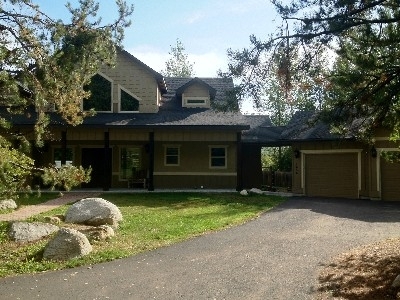 Our cabin is located in the desirable wooded Timber Lost neighborhood, surrounded by McCall's stunning 27 hole golf course is this luxury 4 bedroom, 4 bath, 4,500 cabin. Views of the Salmon River Mountains from the living room. 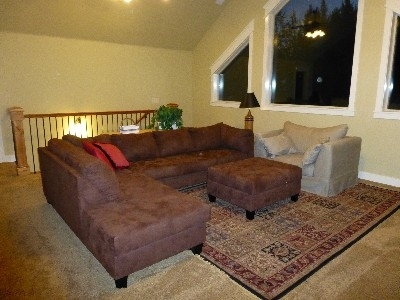 Easy walking distance to the golf course, club house, Payette Lake beaches and Ponderosa State Park. Enjoy nature on the paved meandering bike path that rolls through the nearby hills that is just minutes from the front door. This magnificent home comes fully equipped with everything you need to unwind for a perfect getaway, including flat screen TVs, Netflix, DVDs, VCR, iPod doc/CD player, gas BBQ grill, movies, games and books. The large master bedroom includes a luxurious king-size, memory foam four-poster bed. Master bath is wrapped in travertine tile, has a full shower, soaker tub and large walk-in closet. 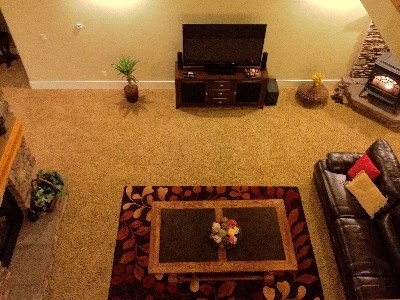 Remaining three bedrooms are spacious and all have their own bathrooms and closets. 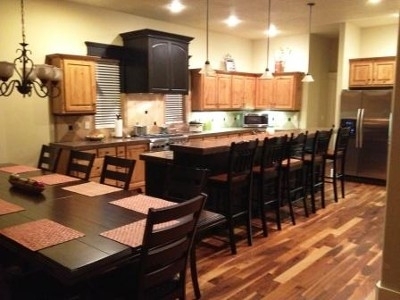 Granite counter tops, expansive kitchen with large dining table. 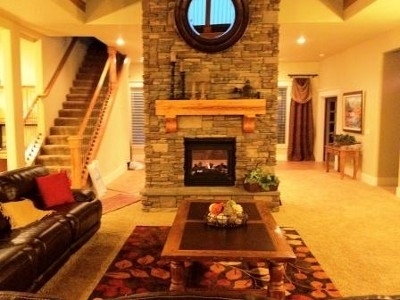 Living area features a cozy two-sided fireplace. Forced air heat is worry free. 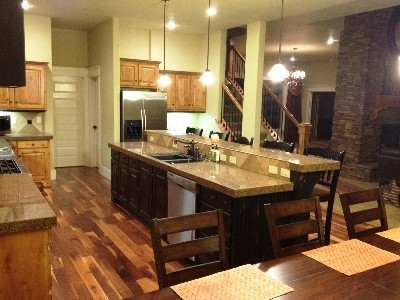 The vacation home is decorated beautifully and wrapped in wood floors, plush carpet and travertine tile. There is plenty to do. 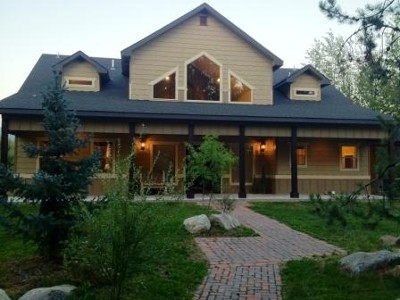 Located right on McCall Municipal Golf Course, 1 mile from Payette Lake or downtown McCall, 1 mile from Ponderosa State Park and only 9 miles from Brundage Mountain Ski Resort. Relax in your private backyard with a view of the majestic Salmon River Mountains, roast marshmallows and make s’mores over the fire pit. Bring all of your snowmobiles, boats, ATVs, toys and trailers as there is ample parking in the garage, driveway and street around the house. adjustable comfort king-size bed. Guest bedroom #1 has a designer queen-size bed. 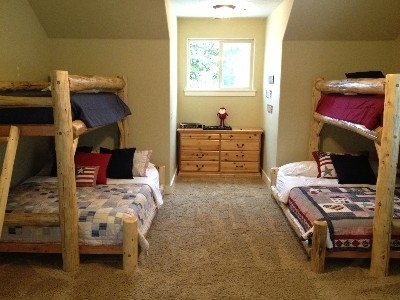 Guest bedroom #2 has 2 locally crafted twin over queen bunk beds and 1 twin over twin bunk bed. Guest bedroom #3 has 2 twin over queen locally crafted bunk beds. Each bedroom has an accompanying bathroom and walk-in closet. with easy public access and ample parking. Pack and play crib available. 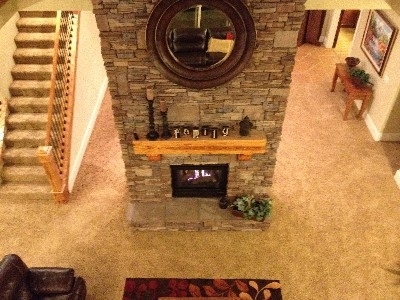 Wood burning stove is a high efficiency pellet stove. 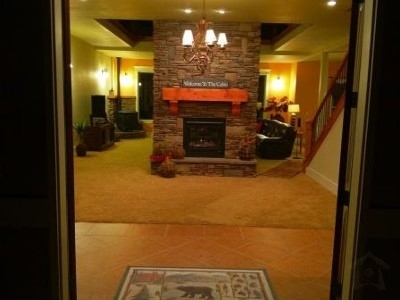 Also has a dual-sided gas fireplace in addition to central heating. Towels Provided. Iron and Board also provided. There are many local hot springs available for you! We also have a deep soaker tub in the master bathroom. 2 high capacity washer and dryers on site. McCall Public Transportation (scheduled bus) runs within 1/4 mile of the cabin. McCall is a beautiful 4 seasons town located 100 miles north of Boise. The drive to McCall along the Payette River is beautiful any time of year. McCall has plenty of activities for the outdoor enthusiast, boutique shopper, golfer, gamer or just about any other thing you can think of- especially great for people who like a laid back lifestyle and want to relax! Come see Ponderosa State Park, Payette Lake, Islands, Wildlife, Fishing, Boating, Hiking, Fresh Air, Camping, Golfing, etc. In McCall spring, summer, fall and winter all offer something unique! 100 miles north of Boise along Highway 55. Jonathan and Marta met while attending college in Idaho, got married here, have two children and absolutely love living in this pristine, outdoorsy state. On their honeymoon they snowmobiled through eastern Idaho and Yellowstone. Jonathan is an Idaho native. Marta is from Europe, has deep ties to her roots and is a proud tour guide when friends and family come for visits from 'home'.